Lock in a great price for Hotel Ester – rated 8 by recent guests! Location was fantastic, comfortable and clean, safe, quiet at night. Reception was super friendly and helpful. Definitely recommend! They organized my tours and helped me with transportation. Restaurant was super friendly as well. Would stay again! The situation of the hotel is perfect for exploring the main sights of the city . We had a deluxe room on first floor . 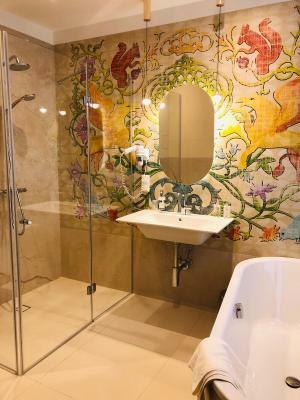 Great bathroom ! Music from a live band playing traditional music was a great addition! Everyone was very helpful and accommodating. Loved that you gave me a big room with a bathtub as I requested. I enjoyed everything. Excellent location in old Jewish quarter. Very nice rooms with modern bathroom. Hotel Ester This rating is a reflection of how the property compares to the industry standard when it comes to price, facilities and services available. It's based on a self-evaluation by the property. Use this rating to help choose your stay! 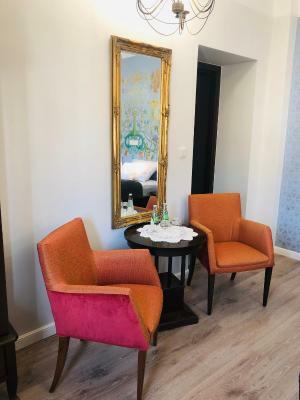 The Hotel Ester is located in the heart of Kazimierz, Kraków’s historic Jewish district, within 50 feet of the Old Synagogue. 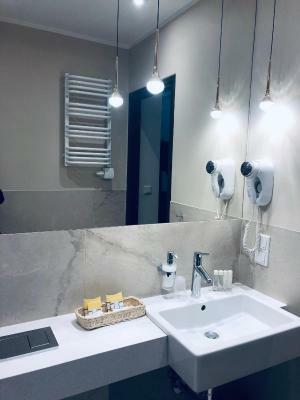 All rooms have private bathrooms and a free Wi-Fi connection. Ester’s air conditioned rooms all feature flat-screen satellite TVs. Each has a work desk and a refrigerator. A safe and free mineral water are also provided. In the mornings a breakfast buffet is offered on-site. 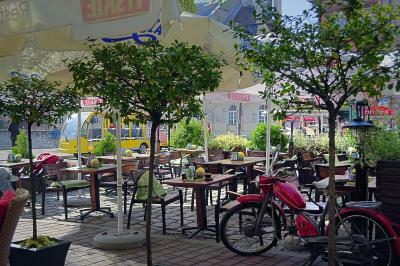 Later in the day, Ester’s restaurant serves traditional Polish and Jewish dishes. After a meal guests can get a massage or visit the hotel’s sauna. The hotel’s staff is available 24 hours a day. The hotel's tour desk will help guests organize trips to the many places of interest that surround Kraków, such as the Wieliczka Salt Mine. The Wawel Castle and Old Town’s Main Market are within the is one mile from the hotel. When would you like to stay at Hotel Ester? Air-conditioned room with a bathroom and cable TV. Spacious with a seating area overlooking historic Kazimierz district. House Rules Hotel Ester takes special requests – add in the next step! One older child or adult is charged PLN 53.70 per person per night in an extra bed. Hotel Ester accepts these cards and reserves the right to temporarily hold an amount prior to arrival. Upon request, guests credit card his credit card may be charged in his currency. 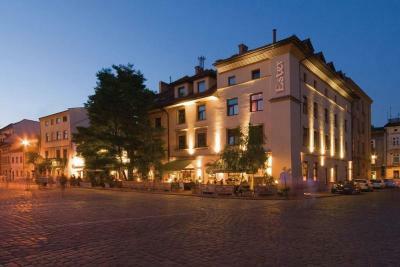 This hotel is in the very quaint Jewish quarter and very traditional.lots of interesting places nearby. To walk to the main square is about twenty minute walk, easy flat walk. The staff were helpful and friendly. My breakfast was not included, but I decided to breakfast there each day. Reasonable price Coffee was good I have to have my caffeine fix! choice of food good too I have been to krakow before but in a different area.When I was there last I did a reccy and found the Ester. Room was fine, very comfortable bed, lovely plump soft pillows and good hot shower. Room service was good with a very pleasant lady making the bed etc. Yes, I did leave a tip for her !! You can book excursions from hotel they are no more expensive than other outside agents. Coming home I booked taxi from hotel for £20 to airport, as I had looked at other taxi services but hotel price was the same, and very reasonable. 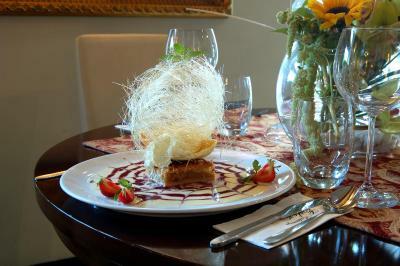 I have already recommended Ester hotel to three lots of different friends who are visiting soon! All staff er good, particularly the young man who served me breakfast. Don't park in front of the Police Station, even if its just while you check in! I did, and had to bump over the kerb on my motorcycle as a police van intentionally blocked me in, and they wouldn't move it when i went in to ask. 1.No cable tv. All polish channels - I am english speaking and for a 4 star hotel it is surprising that there is no cable t.v. 2. I was stuck in the elevator for 30 min and no one could hear me. Good thing I had my phone. The breakfast was the worst I have had on a city break. I recommend to eat out for breakfast. The decor was a bit dated but it was spotless. Upon arrival our initial impression was of a well presented hotel in a pleasant square in the old Jewish quarter of Kraków. Reception very pleasant and helpful. Inside the hotel the decor is a little tired and could do with a refresh so in our opinion not quite to 4 Star standard that the hotel advertises. That said, interior is smart, clean and comfortable. Our room was a little on the small side but comfortable and adequate. The bathroom was of a good standard and impeccably clean. Sound proofing of the rooms was a little poor for our liking, that said we are not townies and used to darkness and silence at night. Despite being on the second floor, we could hear the restaurant furniture two floors below us being moved around late in the evening. Coffee making facilities were a bit hit and miss. Perhaps in Poland white coffee is uncommon but to find no creamer or coffee whitener in our coffee station was a little odd. (Note tap water is safe to drink in Kraków) All of the hotels in the Square advertise a Klesmer band playing traditional Jewish music and the Ester is no exception. A quality four piece band with Double Bass, Guitar, Clarinet and Vocals. Nice backing music to a light lunch or dinner but the set a bit repetitive. I must note here my partner and I are not Jewish so perhaps this type of music just not to our taste. Breakfast is typical Eastern European with a nod to a full cooked breakfast on offer with fried eggs and delicious polish sausage. Lots of cheese and cold meats but rather lacking on the pastries. Pancakes were on offer every day and were delicious but filled with some sort of sweet cheese (perhaps ricotta) To be honest from our opinion the jury is out on that decision as pancakes don’t need a filling. Compared to the other Hotel / Restaurants lining the square (and there are a few) the speed of service at the Ester was a little slow (we sampled most of the competition).